I am a first-time mom and this year was the most beautiful year of my life. Was it easy? No! But I did change a lot. 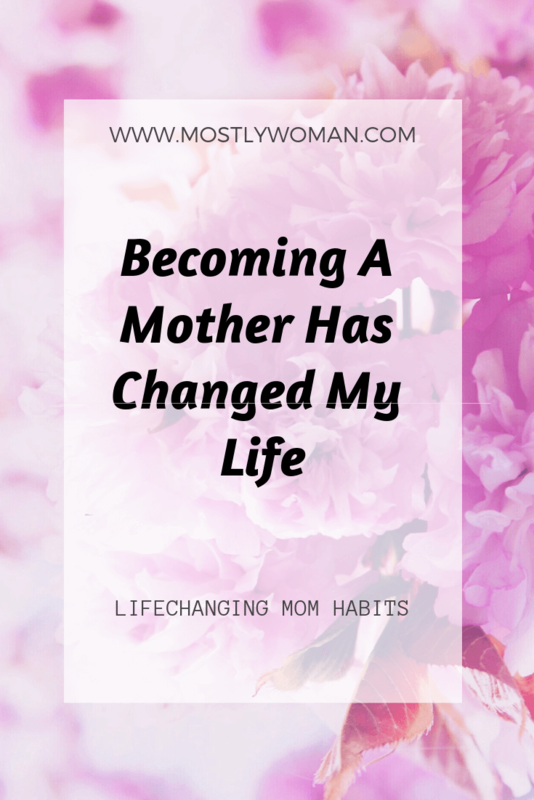 Becoming a mom changed me as a person. 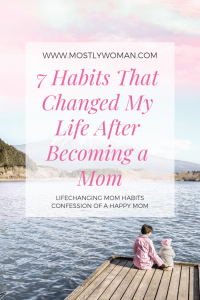 In this article, I share my 7 mom habits which changed my life. Some things I learned the hard way and some came naturally. 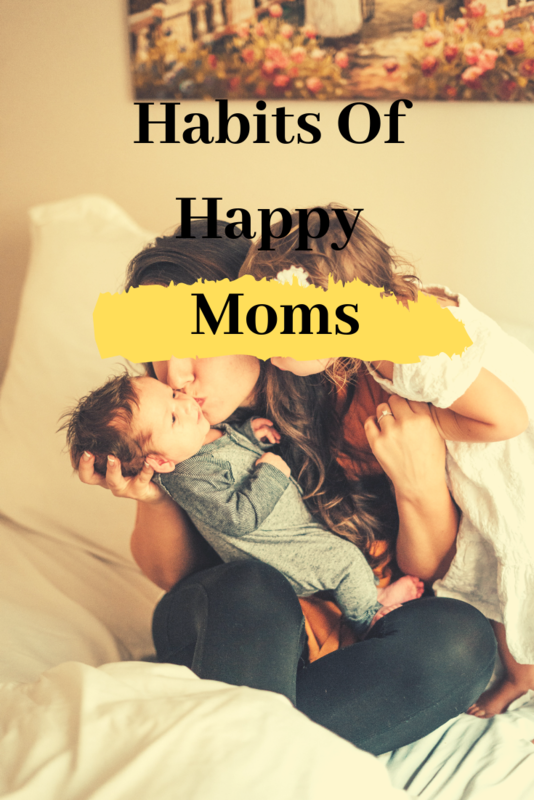 I wonder if you have some new habits that totally changed your life after becoming a mom. Being a mom is the most responsible job in the world. At least for me. If you are a mom, you do understand me. Life will never be the same again and I don’t have free time anymore – especially with a little baby. I am a stay at home mom and also work from home. I clean, cook, do laundry, wash the dishes, take care for my baby, write, work and really need more time for myself. If you are SAHM, you understand when I say I need more ME time. On the other hand, people don’t believe me when I say that I am so tired because I don’t have a 9 to 5 job. To survive, I developed these mom habits that changed my life. 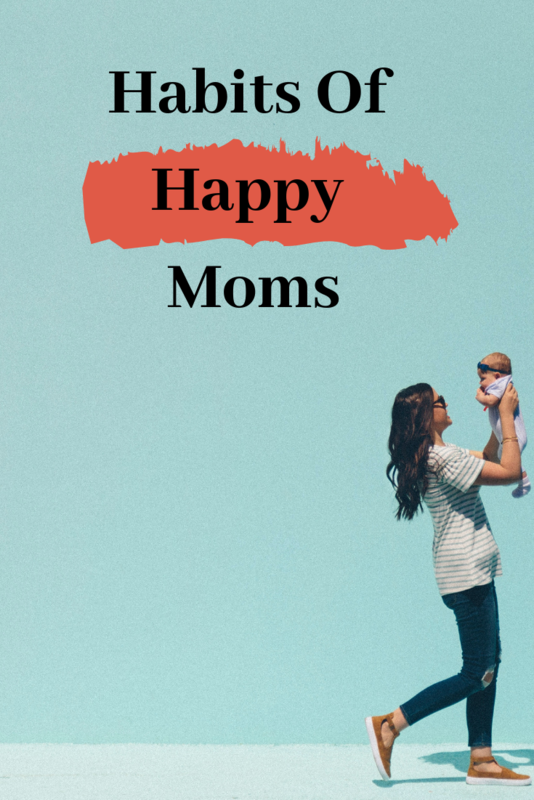 These mom habits help me to feel happier and live a more productive life. Every person is different, and maybe these habits won’t be a perfect fit for you, so pick and choose what works for you. My baby boy is the reason why I am so productive this year. He gives me the motivation to live and to be successful and healthy. He gives me strength and being a mom is the most important role in my life. Now I feel more love for my mom and I know how it feels to love unconditionally. Habits are a powerful tool to succeed or to destroy your life. You are responsible to chose what to do with your life because your habits will determinate your future and character. Yes! My baby is an early riser. This is definitely a habit which came naturally. I didn’t plan to wake up so early. He wakes up every morning between 5 and 6 o’clock. The first few months I was desperate. But today, I am so grateful for that. I am thankful my baby wakes me up so early. We have plenty of time to hug, cuddle, play and eat in the morning. It is still dark outside, but we have some quiet time. On the other hand, I have more ME time. I have time to make my breakfast, to put makeup on (if I need to), time for coffee and also more energy. This way I am never late, I am never in a rush for appointments. I definitely now know what it means to have a natural way of sleeping habits. My baby falls asleep when the sun is down and wakes up when the sun rises. Before him, I was a night owl. Working at night and suffering from insomnia. Now? No! Now I can’t wait to sleep. I can’t accomplish anything after 10 o’clock. Mornings are the most productive time of the day – when you have time to have breakfast, drink your morning coffee, exercise or anything else you want to do. You are one step ahead of others. And the great thing is – there is no difference if I sleep one hour more in the morning. If I go to bed late, I will still be tired the next day. The journey of a thousand miles begins with one step and I want that step to be planning. Everything in life needs a good plan and organization. Planning is so important in my life now, and I wonder how I was functioning before. Now I understand when my father was telling me that every wise man writes down everything and the fool remembers. I can’t remember almost anything these days, with so many things in my head and life. Keeping a list of things to do is the best thing that happened to me. Now I don’t need to remember. 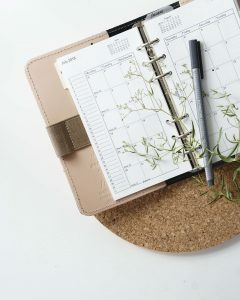 I don’t need to remember dates and anniversaries, nor groceries or tasks continually. I write down everything now. Every idea I have, everything I want to learn and make. I have several planners. But you really only need one piece of paper for it. I have a planner on my phone. There are several free applications which you can download and organize your life. Every morning I make a plan and a to-do list. I have a daily to-do list, weekly, monthly and yearly. Of course, this plan is changing, and there are some things I can’t make the same day, but I never forget anything. We were moving out of our apartment last month, and I was so tired and overwhelmed. I forgot to change my baby’s diaper. I was hysterically crying. How could I forget it? Well, I did. He is fine! He is happy! But his diaper was full, and I didn’t notice. This is why I have several planners now. One is only for home. When and what to clean, buying groceries, what to cook for dinner, etc. One for baby where I write down to change his diaper and clothes, recipes to eat, which solids I have introduced, bath time, milestones, etc. Another one is for business ideas, for the blog and for the project I am currently working on. And one is only for me, self-care, things to buy, what to learn, etc. While I am working, washing the dishes, ironing clothes, cleaning the house and before bed, I listen to audiobooks. Also, some inspirational and educational YouTube channels. As I said, I don’t have time for wasting and thank God I am able to find audiobooks these days. Before I had my baby, I was reading at least one book a month. Now I listen for several hours a day when I have more time, or at least 30 minutes a day. 30 minutes daily listening educational or inspiration videos will completely change your life. There are many motivational speakers and educators online, and the best part is most of them are sharing knowledge for free. So you can educate yourself for free and clean the dishes at the same time. This habit is the habit that changed my life completely. I actually get inspired to develop some new habits because of this habit. I was trying to live in the here and now for 6 years in therapy. Every client was told to live in the present moment and be mindful. But it was so hard. 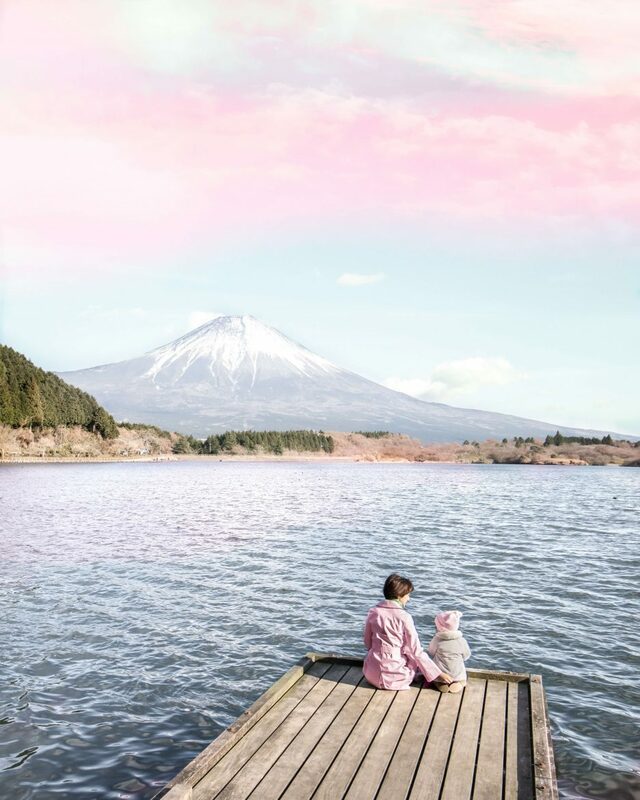 We were raised with so many expectations and pressure so somewhere on the road of growing up, we forgot how to live in the moment and start living in our past or future. Most people tend to live in the future. I do believe that it is good to think and plan for the future every day for several minutes to relax. But visualization and continually living in the future is not the same. Many people lose themselves in their thoughts and forget how to enjoy the present moment. They forget that the future does not exist. We are creating the future HERE AND NOW. To be mindful is to be happier, healthier, to have more significant self-esteem and to love your life and yourself with all your weaknesses. Something my baby boy taught me is to live in the here and now. Babies and little kids live in the present moment. They don’t have distractions. They enjoy at the moment. In the beginning, it was really hard, but after some time I started making changes. Practicing mindfulness became a habit of mine. I started doing mindfulness exercises every day. Focusing on the environment and concentrate on my body. When you make this every day living in the present moment is so much easier. Playing with my baby made me so much more relaxed. I don’t care about anything but this moment. His smile, his eyes, his baby talk. He taught me one of the most essential things in life. So if you want to change your life, this is something I do recommend. Living in the present moment is the most critical tool in improving your life and being successful, but most important in being happy. After labor, I wasn’t feeling very good and I found out that I have vitamin D deficiency. I started using a vitamin D supplement and also eat food rich with vitamin D and Omega 3 fatty acids. Vitamin D has a vital role in our health and there are many benefits to increase vitamin D.
This habit helped me to manage my hair loss and fight postpartum depression. Also, fatigue and weakness. It is always smart to test your vitamin D levels. I was surprised by its benefits. I am aware that now when I am a mom I am also a role model for my child. This is why I started to take care of my overall health and eat healthily. I drink more water and drink herbal teas. I supplement my body with vitamins and make sure my baby eats healthy too. There is plenty of vitamin D in fatty fish like salmon, beef liver and egg yolks. Deciding which things are most important to do was so hard for me before being a mom. Now I learned how to set priorities. This is something that goes hand in hand with keeping a list of things to do. But the difference is I don’t set the priorities myself. We do it as a family. We want to set only 3 priorities daily. The first place is always for our baby boy. That is why these priorities are still different. No matter what, the first place is anything related to our baby. Every morning we set only 3 priorities. They are a must, and everything else can wait. So when I have to post a new blog the second priority is to write a new post. Why only 3? I think that I can only manage 3 things daily. Some days I have more energy, and I can manage to do more, but usually, I can do only 3. So I take care of my baby boy, I work from home, and there is always something else. If you feel you can manage to do more – great! I would burn out. Then I check my calendar. Is there something I can do today to make more ME time tomorrow? I save much time with this rule of 3 priorities daily. There are days when I don’t have much work, but I do work because the next day I can have more time for myself. And ME time is one of the 3 priorities. And last but not least, this is the habit I had to develop when my baby started crawling everywhere. I vacuum and mop every day. Also, I always take care of hygiene in our home. Before, when hubby and I were alone, I was cleaning only twice a week. Sometimes even less. I was just tiding up the house, and that was it. Now I really care about everything to be very clean. I put away every dangerous object in the house and babyproofed almost every room. I like this habit although it can be very hard sometimes because I am exhausted. But because I clean every day, the house is not dirty, and It takes only half an hour for the whole house. Sometimes more sometimes less. I noticed that when I started to clean the house every day, now I feel more organized and calmer. It is a habit I would love to do for a long time. 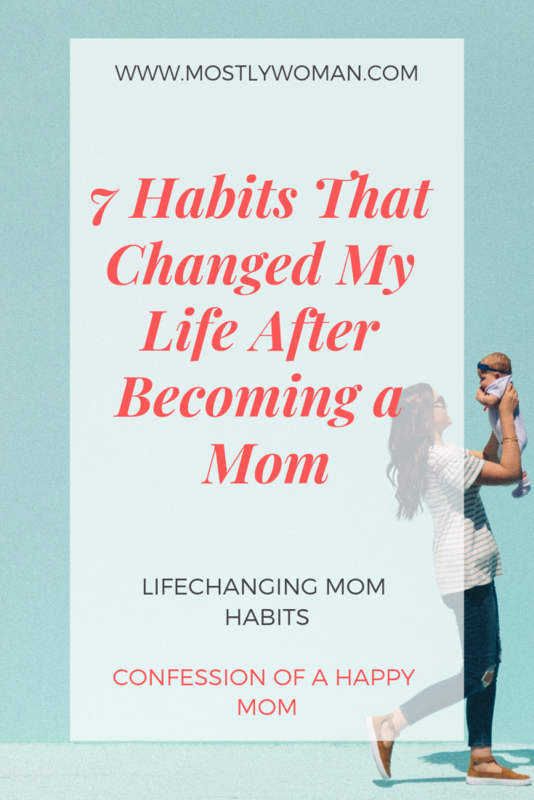 I wonder if you have some new habits that totally changed your life after becoming a mom. These 7 mom habits are life-changing. Loved this post, even though I’m not a mom yet! I’m such a list person, I can only imagine how I will be once I have to take care of more people other than me & my fiancé LOL! I hear you. When I became a mom, my workload at home increased. I was working full time too. So lists and organization became really important. I also loved to read but found I had no time. So like you I started to listen to audio books. AS my son grew, he also took to it and this is how we went through the whole Harry Potter series. Thank you for sharing.